It’s spring! It’s the time of year when fruits and veggies that haven’t been readily available all winter, start to make their reappearance in our markets and the bounty of food that surrounds me really starts to hit home. We are so fortunate to live in times and places of plenty, and we food bloggers celebrate this every week in our posts. Now, lest you think that I have gone soft in the head and am confusing the season with Thanksgiving, my ramblings are really just sparked by the title of the cookbook from which this recipe hails: Plenty by Yotam Ottolenghi. I am sure that most of you are familiar with this very popular cookbook, but if you aren’t, I encourage you to check it out. It epitomizes abundance; each page overflowing with gorgeous recipes and photographs made with fresh and healthy ingredients, tempting us at every turn to make another recipe from the kitchen of this very talented chef. I have made today’s recipe numerous times now and every time I do, my taste buds jump for joy (so does my husband!) It is one of those recipes that I keep coming back to because I literally need to experience this combination of flavours again. If you are having a little dinner party, make this recipe and you will so impress your guests! That is why I have brought it tonight to Fiesta Friday! I know the gang there will enjoy it! If you haven’t checked out the hottest blog party in the blogosphere yet, come on over! There is a link on our host Angie’s blog, The Novice Gardener. One click and you open the door to a myriad of scrumptious things to feast your eyes on, and plenty of super nice bloggers too! In a small saucepan, gently warm the vinegar, sugar, and salt for up to 1 minute, just until the sugar dissolves. Remove from the heat and add the garlic, chili and sesame oil. Allow to cool, and then add the lime zest and juice. Set this mixture aside. Heat the sunflower oil in a large pan and shallow-fry the eggplant in batches. Once golden brown, remove to a colander, sprinkle liberally with salt and leave there to drain. Cook the noodles in a pot of boiling, salted water, stirring occasionally – about 5 to 8 minutes until tender, but al dente. Drain and rinse well under running cold water. Shake off as much of the excess water as possible, then leave to dry on a dish towel. 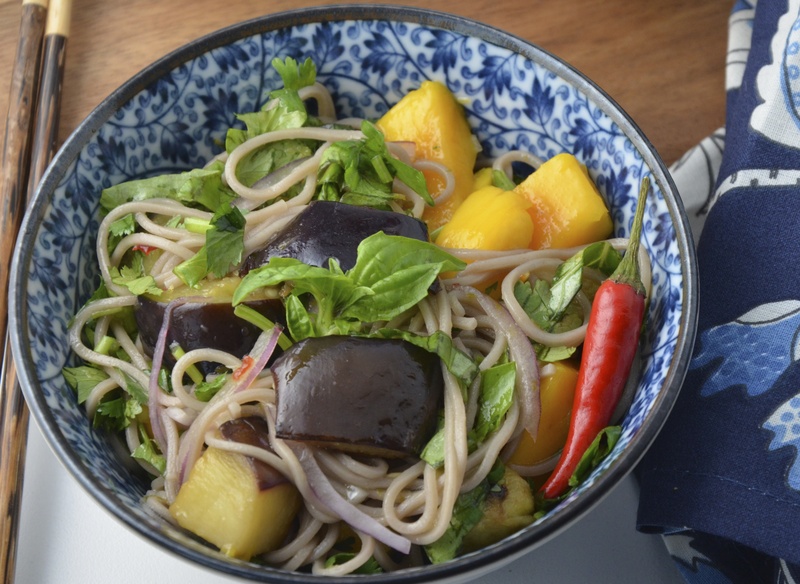 In a mixing bowl, toss the noodles with the dressing, mango, eggplant, half of the herbs and the onions. You can now leave this aside for 1 to 2 hours. When ready to serve, add the rest of the herbs and mix well. Pile on a plate or in a bowl and sigh with delight when the first fork full hits your taste buds! Or burst into song, which I have also done! I wonder if we have spring time in the Philippines, too! Thanks so much Sabine! It seems like many of us are really enjoying the colours and flavours of spring! Thank goodness it is here at last! That looks so delicious Julianna 🙂 I can only imagine how good it would be with eggplants and mango! 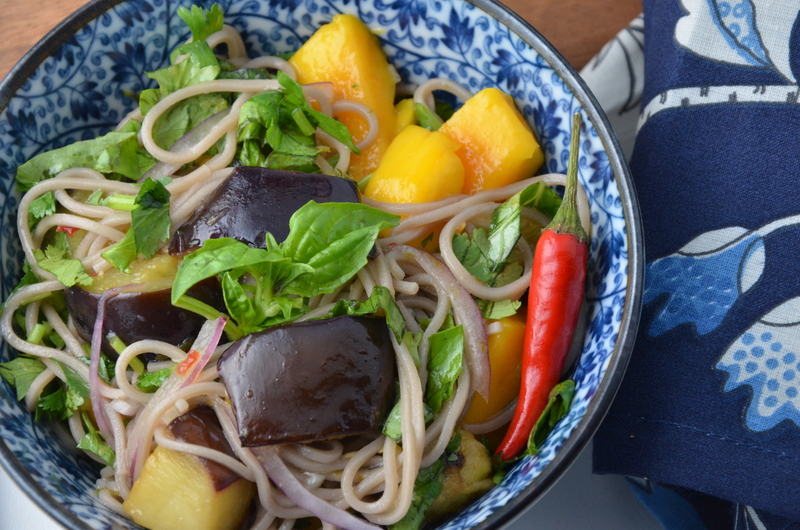 I’ve never thought to pair eggplant with mango, but these noodles look mighty fine! I have Ottolenghi’s other book, Jerusalem. I’ll have to look for Plenty at the library. There’s been so much said about it! Wow, I would never have thought of using mango here – must try this recipe – it sounds as though it’s going to taste as good as it looks, so looking forward to it! Better go back and make more Julianna, cuz I just ate the whole bowl! (That’s what we do at parties right? Hog the bowl? Ok, ok I’ll behave and put some back.) This looks absolutely scrumptious and is making me hungry for some soba and fresh Spring veggies and fruits. Love all that color, too! This cookbook is amazing and I hope you keep posting recipes from it so I can make them after you, like I did those carrots! LOL! You crack me up, Ngan! So glad you’re putting some back :D…but I have a secret stash in the fridge for later…so if you’re still hungry in a few hours, I’ll show you where it is 😀 – only cuz I like you!! And hey, I don’t mind cooking from the book and posting the recipes for you to make! For that matter, I think I have another one coming up soon! Enjoy the party and please leave some food for me 😉 ! 🙂 I checked the cookbook out from the library last year, but I know I’ll have to own it eventually for the beautiful pictures and stories. Until then, I’ll just cook my way through your blog! 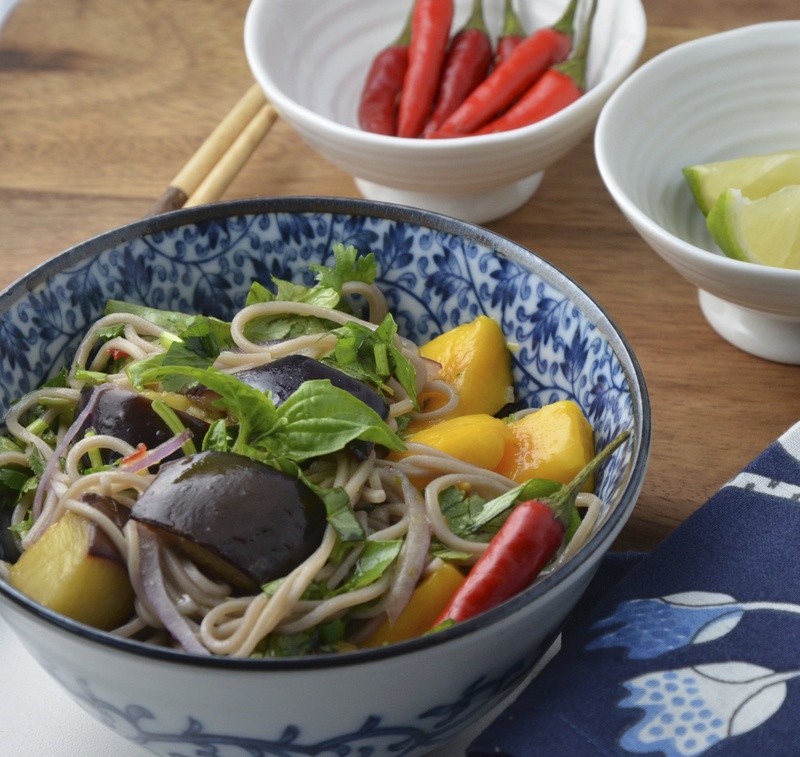 I love soba noodles, and the addition of mango and eggplant is a new idea (to me) sounds delish! Yes, I understand!It was new to me the first time too, but so wonderful! Between you and Dimple….you two are always introducing me to very intriguing dishes that I have never heard of! Looks good Julianna! A fun addition to the party this week! Ohhh! That looks good, Julianna. Although I don’t eat mangoes I love using it in dishes I make for Nikhil! 🙂 What a great combination of ingredients you’ve used. Wow !Julianna this looks incredible! What flavors! I can’t wait to try this! thanks for the recipe. Just out of curiosity, is this a Vietnamese dish? Just love the combination of different wonderful ingredients here! oh np. Was just curious. And I have to get my hands on this book now! 🙂 thanks for introducing! I love the idea of adding mango – really sounds delicious and so creative! Très original ces saveurs 🙂 I love it ! Hi Julianna – I’ve finally made it through the throng to say hello to you! I love Yottam’s recipes and have Plenty on my wish list a the moment. This recipe sounds like an absolute explosion of gorgeous flavours – it will not last long at the Fiesta! Thanks for bringing this along and enjoy the party! This looks absolutely divine! I love soba noodles- so delicious! Wow Chef! Excellent. What a combination of ingredients in a nooe bowl. But if it is right with rice then it is right with noodles :). Gorgeous! I am imagining you bursting into song as you dig in, Julianna. Don’t mind if I join you!! Hi JuJu! Well if you do get this book, you really will never be sorry! Good luck with the basil plants too. There is nothing better than garden fresh herbs! “Plenty” arrived today – I am anxious to look through it and make some new recipes including your recipe. Thanks for sharing… The herb/veggie sale is this weekend at the Botanical Gardens and I look forward to volunteering and shopping for my herbs and a few veggies 🙂 They are selling Thai basil again! My goodness, I just love Ottolenghi recipes! I own every one of his cookbooks!! You’re only missing his first book called Ottolenghi…and I follow him on Twitter and see that a ‘Plenty More’ is in the works! May I scream “It’s Spring”??? Please, say yes. Your soba noodles are the quintessence of the freshness I’m looking for during these first warm days. I had my first plate of soba noodles just 2 weeks ago, I adored them even though the “season” was simple. I bet your eggplants and mango “sauce” has to be amazing! Wow this is delectable Juliana. Wonderful flavors and whole foods, the mango and eggplant. Eggplant and noodles !! Wow, I never thought of this combination. Looks very interesting.